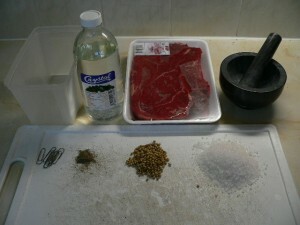 Biltong is a delicious South African recipe used to dry and preserve meat. It was developed in the days before refrigeration but it tastes so good that it is still consumed in large quantities as an any time snack. It goes very well will beer and wine. Here is my basic, traditional recipe, it never fails to attract compliments. 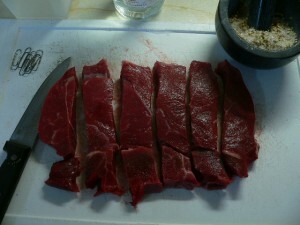 Beef – round steak (topside) 15-20mm thick. Seasoning- coarse salt, coriander seeds, black pepper. Marinating container- deep, narrow, plastic or glass. Air conditioned room, fan and cardboard box. 1. 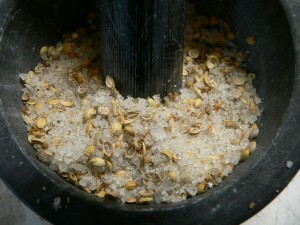 Prepare seasoning by grinding together, in pestle and mortar. One teaspoon fresh ground black pepper. Or multiples there of. 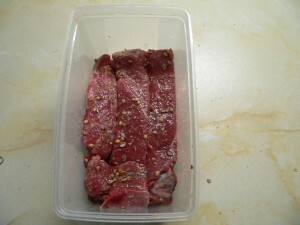 Tip – pepper turns out quite hot on biltong. 2. 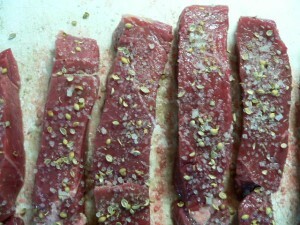 Cut beef into strips 20-40mm wide. white fungus growing on biltong. batches until you get the amount right to suit your taste. Use less for thinner sliced meat. put a reminder on your e-mail. Six week old meat is not pretty. 6. Bend paper clips into ‘S’ shape and hook into strips of meat. like it moist it will be ready in 2.5 to 3 days, dry takes 5 to 7 days.